Mega Sale! Save 21% on the Universal Fit Stroller Organizer with Cup Holders Diaper Bag with Cup Holders Extra Storage Space for Organize the Baby Accessories (blue) by YAKEFJ at Baby Stroller Car Seat Combo. MPN: YAKEFJ. Hurry! Limited time offer. Offer valid only while supplies last. Fits everything you need Stroller organizer features multiple pockets and compartments and will fit everything you need for a busy day out. Think diapers, baby wipes, snacks, cellphone, drinks, bottles, favorite teddy, pacifiers, and more. Have everything in one organized spot with your stroller organizer! Keep Organized on the go : Baby Stroller Organizer has pockets and compartments of various sizes to help you stay organized. 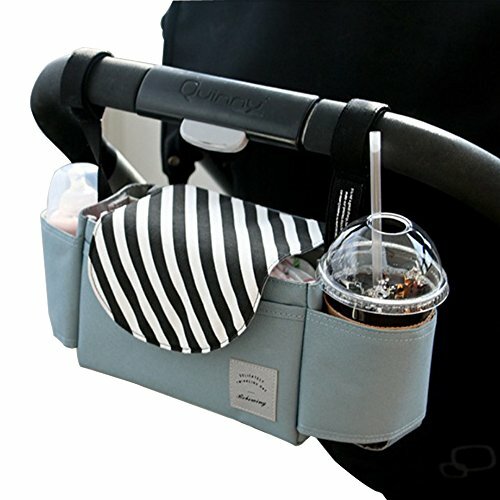 Insulated 2 cup holders are super deep and will keep your drinks or baby bottles safe. This bag is great for a day out, trips, airports, parks and more! High quality and good looking , Crafted from the highest quality Oxford cloth, our organizer is super durable and will last you through many many uses. No need to worry about messes and spills anymore, the organizer is washable and will look like it's brand new again after a gentle washing cycle. Easy to install: our stroller organizer are very simple to install ,simply adhere the adjustable velcro straps to your stroller handles or handlebar and adjust as necessary. Size: 35*12*12CM/13.8*4.72*4.72inch, Package included: 1pcs stroller organizer bag. If you have any questions about this product by YAKEFJ, contact us by completing and submitting the form below. If you are looking for a specif part number, please include it with your message.